Into the Woods teaser: Meryl Streep, Anna Kendrick cast a spell in the movie’s first teaser trailer (VIDEO). James Corden (the Baker) and Meryl Streep (the Witch) in Into the Woods. Photo courtesy of Walt Disney Studios Motion Pictures. 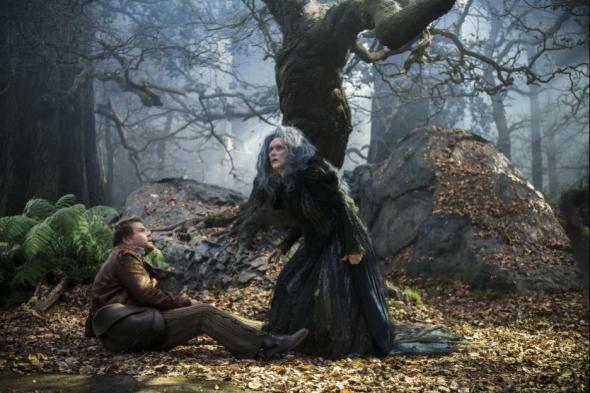 Like many recent stage-to-screen musical adaptations, Stephen Sondheim and James Lapine’s Into the Woods has taken many years—decades, in fact—to make it to the big screen. The beloved show, which weaves together the personal wishes and journeys of well-known Grimm’s fairy tale characters, has been professionally staged many times since making its Broadway debut in 1987. But only over the last couple of years has the movie adaptation become a reality, with Rob Marshall (Chicago) at the helm. The teaser is finally here, and aims to enchant the audience with its impressive cast and stunning, dark visuals. Anna Kendrick appears as Cinderella with Chris Pine as her Prince, alongside Meryl Streep as the Witch and Emily Blunt as the Baker’s Wife. But the trailer also employs a bit of mystery as well: Johnny Depp, who plays the Wolf, is curiously obscured, with only his giant claw visible as he creeps behind a tree. And should you have only a passing knowledge of musical theater, you may walk away from it not realizing the film is supposed to be a musical—which is perhaps by design. With the exception of the show’s oft-repeated lyrical motif, “I wish …” there’s little actual singing and dancing. Still, it’s hard not to be caught up in Sondheim’s music, and with a cast like this, it seems sure to attract an enthusiastic audience—and possibly, even, critical acclaim. Into the Woods opens on Christmas Day.